Originally a CART event, this is the second longest running street race on the calendar after Long Beach. In the spring of 1985, Molson Breweries in-house promotional division, Molstar Sports & Entertainment, proposed the running of a CART race at Exhibition Place in Toronto, as an alternative to the Candian F1 Grand Prix, which was sponsored by rival brewers Labatt's. The race was first held the following year on July 20, 1986 and was known as the Molson Indy Toronto. It was won by Bobby Rahal, driving a March 86C-Ford Cosworth DFX for Truesports. With the demise of CART, the race morphed into a Champ Car World Series event, changing its name to the Molson Grand Prix of Toronto, continuing until 2007, after which Molson dropped sponsorship of the event. The Steelback Brewery signed a multi-year, multimillion-dollar deal to become the event’s title sponsor, renaming it the Steelback Grand Prix of Toronto and though unification of the Champ Car World Series and the Indy Racing League was announced on February 22, 2008, the race that year was cancelled. 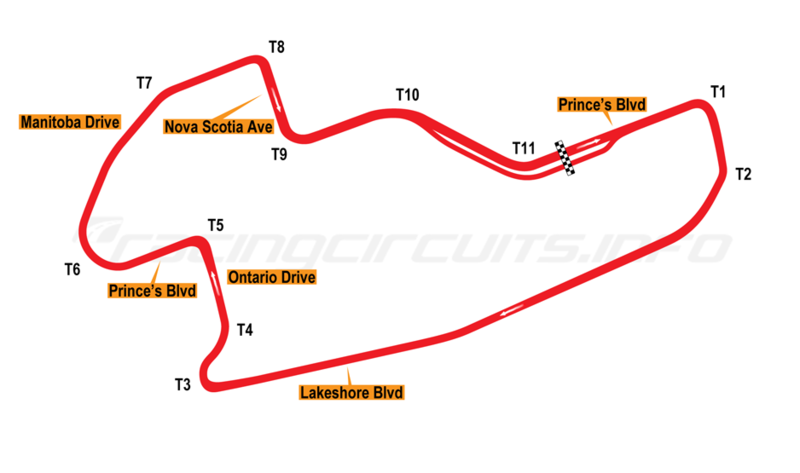 It returned in 2009, after Andretti-Green Racing, acting as the event organiser and promoter (later Green-Savoree Promotions), had purchased the assets of the former Grand Prix of Toronto, as well as signing a multi-year agreement with Honda Canada Inc. Since then the event has remained on the calendar and although the race had been traditionally held in mid-July, there were concerns that the 2015 race might be cancelled, as it would clash with the Pan-American games also being held in mid-July. However it was moved to June but unlike the two previous years there was no double header. Like year's event, it is back to it's traditional mid July slot and remains a single race. The driver with the most wins: 7, Michael Andretti: 1989, 1991, 1992, 1994, 1995, 2000, 2001. The team with the most wins: 8, Newman/Haas Racing: 1989, 1991, 1992, 1995, 2000, 2002, 2004. The original 1986 track length was changed from 1.784 miles (2.871 km) to 1.755 mile (2.824 km) in 1996, due to construction of The National Trade Centre building, which led to the pit straight being lengthened and last turn being altered. Last year, major changes were made to the track. 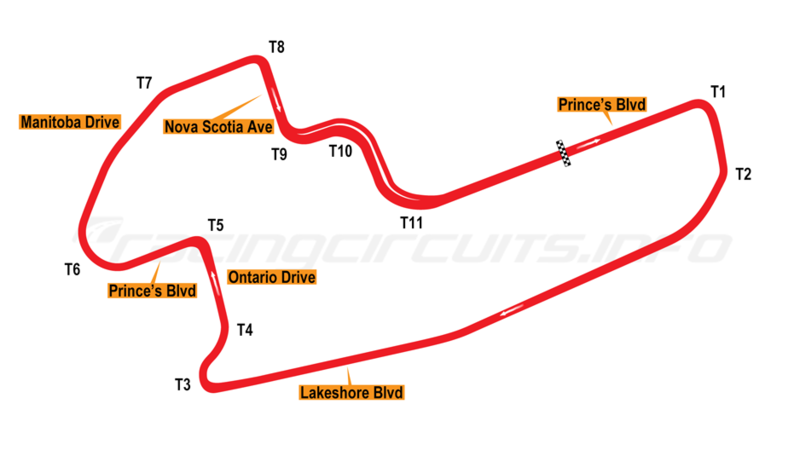 The Pit Lane was been moved to the North side of the track, starting at Turn 9 and extending back onto Princes' Boulevard, past Turn 11. The hospitality suites have also moved to the North side and the Turn 11 grandstands are now on the south side of Pit Lane. However, the paddock remains in its original location, linked by a pedestrian bridge. July 17th, 1999. Gil de Ferran, 57.143 seconds, 110.565 mph (177.937 km/h). Pagenaud took pole but at the start Castroneves managed to pass both Pagenaud and Rahal, going into Turn 1, for the lead. Dixon managed to get to the inside of Power and move into third. However, as the cars approached Turn 3, Dixon went wide to avoid hitting the back of Rahal but made contact with Power, forcing him into the outside wall. Power suffered terminal suspension damage, dropping him to last place and ending his race. Dixon limped around the track with a flat tire, which, after pitting, sent him to the back of the field. He would then be given a drive-through penalty for entering a closed pit-lane. The incident brought out the race's first caution period. Racing resumed on Lap 6, with Castroneves leading Pagenaud, Rahal, Newgarden and Hinchcliffe. The top five remained unchanged until Lap 20, when Spencer Pigot, who had charged through the field, passed Hinchcliffe. Soon after, drivers began to make their first scheduled pit stops, including Hinchcliffe, Rossi and Newgarden. Just as Newgarden entered the pits, Tony Kanaan nosed into the wall at Turn 1, bringing out the race's second caution, which forced the leaders and anyone else who had not pitted, to make their first stop under caution and lose track position. Newgarden was the biggest beneficiary of the caution,putting him into the lead, as the leaders came into pit lane. Behind him were Jones, who had not yet pitted, Kimball, Rossi and Hinchcliffe. The race resumed on Lap 27, with the top five places remaining unchanged. Further back, Sato suffered front wing damage and a punctured tire, forcing him to pit again. On Lap 29, Jones began to fall back down the field due to worn tires, losing position first to Kimball, then to Rossi, Hinchcliffe and Andretti, before finally pitting on Lap 33. Several drivers began to make their second scheduled stops shortly after, including Muñoz, Dixon and second-place Kimball. This promoted Rossi to second, meanwhile Newgarden continued to extend his lead. The running order remained the same, until the leaders made their stops on lap 54, as Newgarden led the top five into the pits. Chilton briefly inherited the lead before handing it to Pagenaud, with his stop one lap later. Pagenaud led until Lap 57 when he pitted, giving the lead back to Newgarden. The order now was, Newgarden, Rossi, Hinchcliffe, Dixon, Andretti. Dixon would pit for the final time on Lap 61, putting Hunter-Reay into the top 5. The top five remained the same until Lap 81, when Hunter-Reay ran wide at Turn 7, allowing Pagenaud to take 5th spot. Up front, despite dealing with a dueling Sato and Daly, Newgarden held on to take his second victory of the 2017 season by a comfortable margin of 1.87 seconds over Rossi, while Hinchcliffe finished third. Andretti secured his first top 5 finish in IndyCar, since his fourth-place finish at the 2015 MAVTV 500. Simon Pagenaud, 58.9124, 109.14 mph (175.64 km/h). I heard there has been repaving on the start/finish straight leading into the first turn, presumably smoothing out some of the major bumps. The race on Sunday will also be shown on the CityTV over-the-air stations. The top six, looks like it will be an even fight between Chevy and Honda. That was a bit scrappy, 5 wide as they went down to Turn 1 but they made it through. Bourdais loses it at Turn 1 but no FCY, yet but his rear wing looks very precarious. I've tuned in.....Dixon will break down now. First FCY as RH-R goes into the tyre wall at Turn 3. Rossi's front wing is in danger of falling off. Looks like Rossi made contact with Power. Chilton caused a big shunt by braking ridiculously early on a restart. What a crazy restart. Leader in the wall before the green and then a 5-6 car accident at T1. Power just...drove straight into the tyres. Really weird. Looks like I jinxed all the other drivers....now Dixon leads. Has there been a second FCY? Yeah, 5 car pile up at T1. Thanks, the feed dropped for about 5 minutes. 3rd FCY as Binder stalls at Turn 8.